It appears that this person wasn’t a developer after all, as pointed out by Kotaku. An EA developer who recently commented on Star Wars Battlefront II’s controversial progression system has now received numerous death threats and more than thousand personal threats. As covered earlier, the Star Wars Battlefront community is in an uproar following the publication of a spreadsheet that suggested that it would take 40 hours of gameplay to unlock just one of the many heroes available in the game. Following the community outrage, EA developer Sean (@BiggSean66) took to Twitter to point out that the published spreadsheet is wrong as many factors haven’t been taken into account. Right? Over a freakin video game. I been getting used to it, as this has happened over the last 48 hrs, but then when telling my wife about it just hit me so hard when! This is a video game FFS! Interestingly, Sean states that he hasn’t even worked on Star Wars Battlefront II, but is accused of lying down with ‘dogs’ nonetheless, thereby referencing to publisher EA. Surely, things are getting out of hand when people are receiving threads, even more concerning death threads, over an unpopular feature in a videogame. Meanwhile, Star Wars Battlefront II’s designer director, Dennis Brännvall, has replied to some of the game’s progression comments on Reddit. Apologies for not being more active these past weeks leading up to launch – as you know things get really hectic and you tend to spend whatever spare freetime you have recovering. I really regret not being here on the subreddit at the start of the early access. Hopefully some of these replies will bring some clarity and hope. Performance during games will affect the amount of credits you get at the end of a match. Matchmaking will take into account not only player skill, but also total gametime and rarity of star cards. This means that you will be matchmade with players with an average performance similar to you and (to the largest extent possible) not against players who are much better than you, whether by having higher rarity cards or by showing higher skill. Heroes that are locked at launch will only be unlocked with credits, not crystals. The heroes, similar to the locked weapons for Troopers, are sidegrades instead of upgrades (Darth Vader should be on similar power level as Darth Maul, etc). The goal is to keep you playing for a long time and have something cool to look forward to as you earn credits. Speaking of earning credits, we’re constantly evaluating and tweaking the earn rates versus the cost of crates and heroes. The current rates were based on open beta data, but you should expect us to constantly evolve these numbers as we hit launch and onwards. There will also be more milestones that award credits and crafting parts available, as well as star cards only unlockable through those milestones. If all you want to do is play and grind towards your next unlock that will be fully possible and we’ll continue to tweak the numbers until the requirements feel fun and achievable. Working on a game with a live economy and without a premium content lineup is a new challenge for us at DICE. We had one progression system in the closed alpha and heard your feedback back then. We made another iteration for the open beta and heard your feedback then too. For launch, we’re having another iteration and there will definitely be more iterations as we evolve this game post launch. Your continous feedback as you play the game is absolutely invaluable and I encourage you to keep sending it our way. There is really no reason to “rebel” against us – we want this game to be as great and enjoyable as it can be – we’re reading all your feedback and working as fast as we can to adjust the game to your liking. 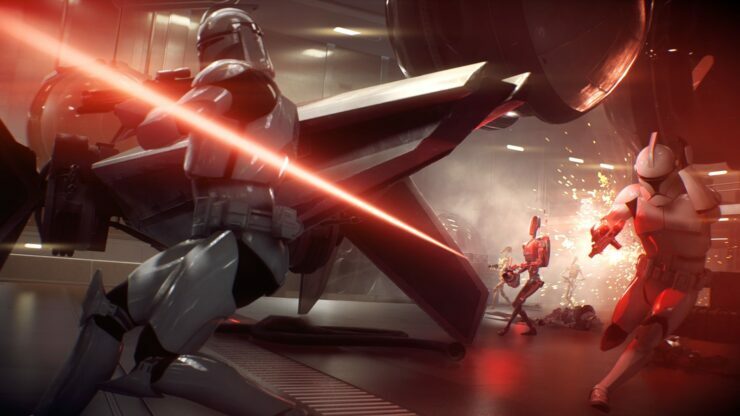 The dev team will be around Battlefront II for a long time. I sincerely hope you’ll be here with us! Star Wars Battlefront II is scheduled for a release on PC, Xbox One and PS4 later this week on November 17. Earlier today we already covered a comment from the game’s community manager that angered the game’s community as well.